I thought this was where I had planted the Tierella cordifolia (Foam flower), but I don't think this is it. Could anyone tell me what this is? Re: What's this native to NJ/Pa groundcover? Those flowers do look very tiarella-like, but seeing RBG's photo of the allegheny spurge it looks very similar in both flower and leaf. 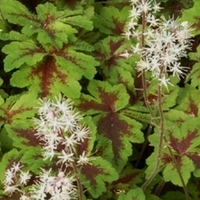 I have several types of tiarella, some clumping and one that creeps (running tapestry? ), and the leaf and growth pattern just don't look quite "tiarella" to me. Yes! I think you are both correct! I kept thinking pachysandra would be solid bright green color and didn't realize the native species was mottled like that. And like you both mentioned, the flowers seemed like Tierella's.